MILAN (AP) — Juventus took a major step toward a seventh straight Serie A title on Sunday as it beat Sampdoria 3-0 after Napoli was held to a 0-0 draw at AC Milan. 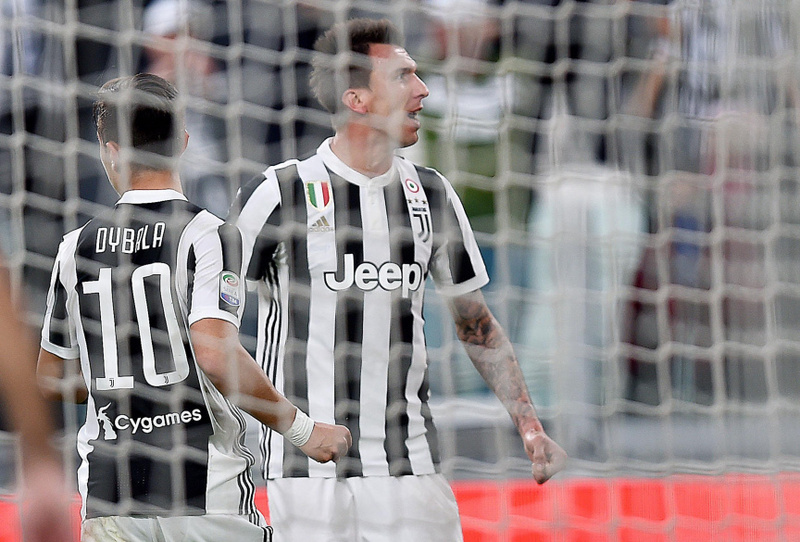 Juventus moved six points clear of Napoli with six matches remaining — including the two sides playing each other. "We have to thank Pjanic for getting injured because maybe at that moment I wouldn't have changed things," Juventus coach Massimiliano Allegri joked. "Douglas and (Gonzalo) Higuain are two players who I wanted to use to change the match. I chose the Brazilian to stretch Samp." Roma hit the woodwork twice but drew 0-0 against 10-man Lazio in an intense derby match which was crucial for both teams' Champions League chances. The top four from Serie A qualify for Europe's premier club competition. Roma and Lazio are third and fourth, respectively, on the same number of points. They are one point above fifth-place Inter Milan, which drew 0-0 at Atalanta on Saturday. Juventus was looking to bounce back from the disappointment of Wednesday's Champions League exit to Real Madrid, decided by a stoppage-time penalty in the second leg when seconds away from forcing extra time at 3-0. Allegri had mixed feelings about Sunday's win. "Is it a decisive step toward the title? Absolutely not. But it was important to win after Madrid and the guys were good because it wasn't easy after such a tiring match," Allegri said. Milan thought it had taken the lead four minutes later but Mateo Musacchio was offside when he fired in a rebound after Reina had parried Hakan Calhanoglu's powerful effort. Roma had the best opportunity of the first half when Bruno Peres' effort crashed off the left post. Despite the numerical disadvantage, Lazio almost took the lead shortly after but Adam Marusic hesitated in a good position and Stephan El Shaarawy's tackle deflected the ball narrowly wide of the left post.